Moreover, as irrigation is essential to keeping the growing global population fed, wise water use is an increasingly important profitability factor for farmers and growers. For this reason, water meters have become an essential part of irrigation. They help collect more accurate data so that growers have access to advanced water use analysis in order to optimize yield and minimize cost of production. BERMAD first invented the water meter with the integrated option of opening and closing a hydraulic control valve over 50 years ago. Since then, we have developed, manufactured, supplied and supported hundreds of thousands of top-quality meters for irrigation that enable more advanced metering applications. 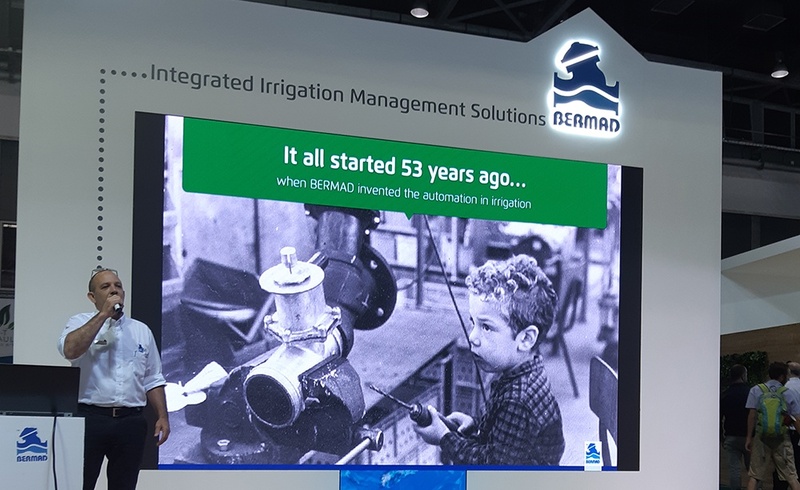 At the recent Agritech 2018 conference in Tel Aviv, we unveiled the latest generation of agricultural water metering technologies, adapted by BERMAD. These technologies lay the groundwork for unprecedented solutions to today’s most pressing irrigation challenges. We will discuss these units below, but first let’s take a closer look at how far irrigation water metering has come as a technology. The standard mechanical meter came into widespread use by the mid-20th century, and mechanical meters are still widely used worldwide. BERMAD’s 900 Hydrometer, Turbo IR and TurboBar Series of water meters offer a choice of easy maintenance magnetic drive circular registers or electronic registers for improved accuracy and programmable convenience. Mechanical meters are reliable and effective, but they do have certain limitations. The moving parts are subject to wear and can be damaged by debris and particles in the line. Mechanical meters are less accurate under extremely low flow rates, which may present difficulties in certain projects and in agricultural consortiums. BERMAD is proud to be at the forefront of irrigation water metering technologies. We offer a range of enhanced flow meters that use electromagnetic and ultrasonic technologies. Both advanced technologies do not have any moving parts and measure extremely low flow rates with a high level of accuracy. Our electromagnetic flow meters are suitable for all types of liquids, including dirty water with larger contaminants. They cost more and therefore become more cost-efficient in relation to their diameter, that is, less so in the field (up to "6~) and more in the main system heads and main water supply system. The past few years have seen a peak in new irrigation water metering technology as the industry slowly embraces the digital age. Smart metering allows growers access to up-to-the-minute information from anywhere at any time. BERMAD’s exclusive monitoring software and MeterApp provide growers with detailed insights into the behavior of their irrigation system; alerts about leakages, low and high flow rates, and other unusual patterns; and the immediate ability to remotely open or close a valve in response to this information—all from the convenience of their preferred mobile device. Electronic registers have been developed to align mechanical meters with electromagnetic and ultrasonic irrigation water meters, offering data-driven insights that improve overall efficiency, optimize energy use, improve yield, reduce production costs and help optimize environmental aspects such as fertilization and chemigation use. This is especially good news for agricultural consortiums with complex water supply systems that must deliver the right amount of water at the right times to meet the needs of a high number of users; and track this usage for reporting and billing purposes. BERMAD smart meters also help farmers achieve hydraulic and energy efficiency. They allow farmers to benefit from volume-based monitoring and controlling irrigation, even if they use a time-based controller or don’t use a controller at all. With literally zero communication infrastructures, farmers can benefit from insight into the behavior of their irrigation system and the ability to remotely control the system based on these insights. At BERMAD, we are committed to developing stand-out products by combining our past experience with future technologies. We have merged our monitoring & control capabilities with advanced IoT capabilities to offer the highest level of hydraulic efficiency, simplicity and reliability available. Realize BERMAD vision and strategy, regarding the development of the Irrigation segment, while carefully maintaining the core values ​of BERMAD. Yiftah works closely with the Regional and the subsidiary (RBC) Directors as the main factor that specializes in the Irrigation segment. Yiftah is responsible for inculcating knowledge and marketing concepts in all BERMAD units of sale and for marketing segment strategic goals while ensuring long-term growth and maintaining profitability and other measures as defined by the management.